You can help spread the Donate Life message everywhere you go! 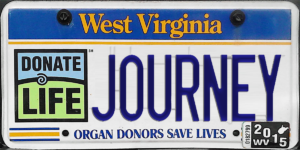 All you have to do is order a Donate Life license plate for your vehicle. For West Virginia, please send your application and check to the West Virginia Department of Transportation.